We feel it is important to personally review your project with you. We can identify unusual circumstances and assist you in resolving issues up front thereby saving you time and money. For example, you may wish to have an RV pad added along the side of your house. If there are drainage issues, we can discuss them with you and help find solutions. 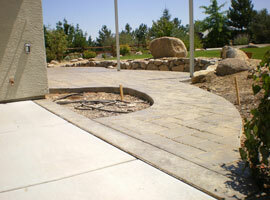 Perhaps you are thinking of a new patio with a BBQ area but don’t think you have the room. 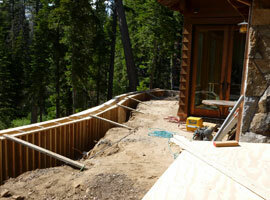 There may be a solution with a retaining wall to open up the area needed for the patio. Or, maybe you’ve only thought of grey concrete – we offer many alternatives such as colored or stamped concrete, washed aggregate, broom and shine finish, swirl and shine finish, etc. We are only limited by your imagination. Our president Gary Crosswhite has lived in the Reno and Lake Tahoe areas for decades. Over the years, he has worked with many well-qualified building professionals both as a general contractor and as a concrete subcontractor and would be happy to give you referrals for any type of project you may be considering. We know your home is one of your biggest investments and we will treat it with care as we complete your project – whether it is a new driveway, patio or even a retaining wall. We look forward to talking with you.